This month's challenge was to make a project around a snow theme. So I pulled out a really small stamp set that had snowflakes in it. 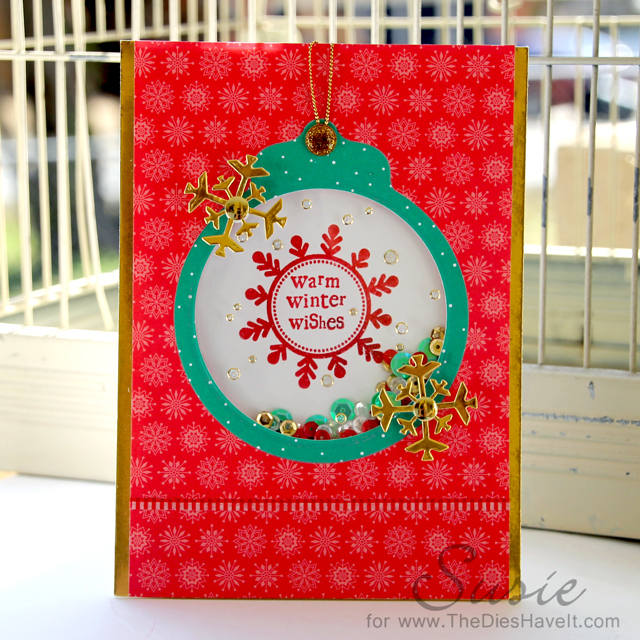 Sometimes it is hard to figure out how to use small images, but a shaker card is usually my answer! I added the gold accents on this card and I just love how it turned out. I hope you like it too. Bright and happy, love the gold snowflakes! Oh, this is so pretty! I love the colours! Such a sweet card and such fun colours! Love the bright colors - great card! Gorgeous card! Love that shaker and the color combo! So pretty! Love the shaker ornament! Colourful and fun card. The snowflake image is the perfect choice for your shaker card! Beautiful take on the snow challenge Susie! love it! I adore your card...love the colors!